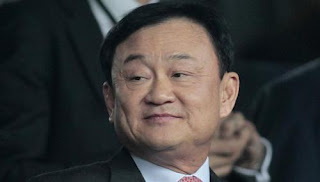 BANGKOK (AFP) - Thailand's Supreme Court on Thursday issued an arrest warrant for ousted premier Thaksin Shinawatra, in the latest abuse of power charges brought against the controversial tycoon. Thaksin, who was removed from power in a 2006 military coup and lives abroad to avoid a separate jail term for corruption, is one of 27 defendants facing trial over loans issued by the state-run Krung Thai Bank. The former prime minister's absence from the Bangkok court "shows signs of evasion", said one of the nine presiding judges. "The court decides to issue an arrest warrant only against the first defendant (Thaksin), and his trial will be pending until the prosecutor can bring him to court," he said.